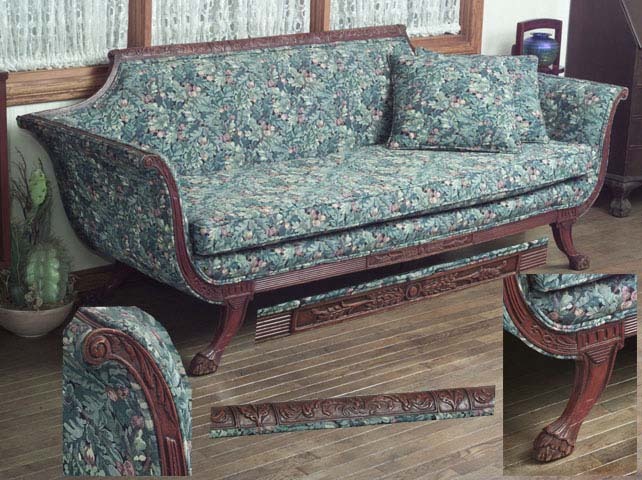 A beautiful, hand carved, antique couch with green floral upholstery. Cushion is a separate unit and it has two matching pillows. The image shows a full length view of the couch and four insets. One, immediately below and between the legs is an enlargement of a section of the bottom panel of woodcarving on the couch. Others show details of a portion of the top panel, the arms, and the front legs.